President Edgar Lungu has commended the Patriotic Front (PF) on the Copperbelt Province for conducting peaceful campaigns, ahead of the Roan parliamentary by-elections. ZANIS reports that the President said this upon arrival at Simon Mwansa Kapwepwe International Airport, ahead of his scheduled campaigns in Luanshya district. The President called on the PF members to continue holding peaceful deliberations until the close of campaigns on Wednesday, April 10th, at 18:00 hours. 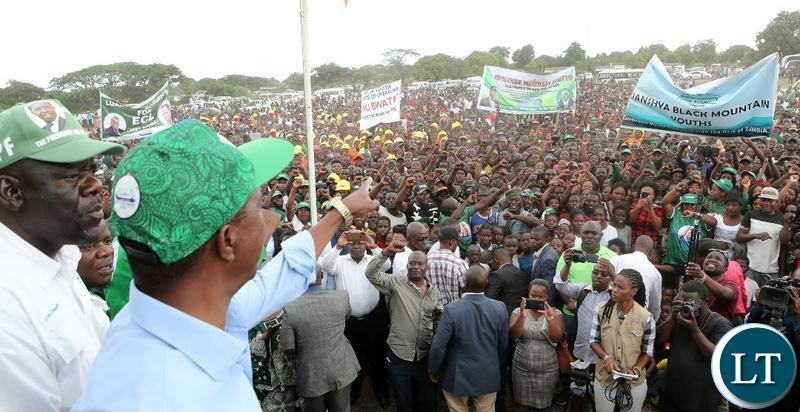 President Lungu said the PF is aware of the strategy by opposition political parties, adding that the PF will however stick to their mandate and distance themselves from any form of violence. And speaking earlier, PF Copperbelt Province Chairperson Nathan Chanda assured the Head of State that the party was strictly adhering to his instruction of conducting peaceful campaigns. Mr Chanda explained that the party has decided not to concentrate on the opposition, but rather confine themselves to issue based campaigns. The Provincial Chairperson also revealed that the party on the Copperbelt has resolved to ensure that they vote for President Lungu back to state house come 2021. Meanwhile, Copperbelt Minister Japhen Mwakalombe who led hundreds of Ndola residents to Simon Mwansa Kapwepwe International Airport to receive the President, said people in the province are elated with the transformation that is taking place. Mr Mwakalombe SAID Copperbelt residents have witnessed numerous developmental progress which include works on the Ndola/Chingola dual carriageway. He added that people in the province were happy with the water reticulation that is taking place and has since created jobs for the locals. 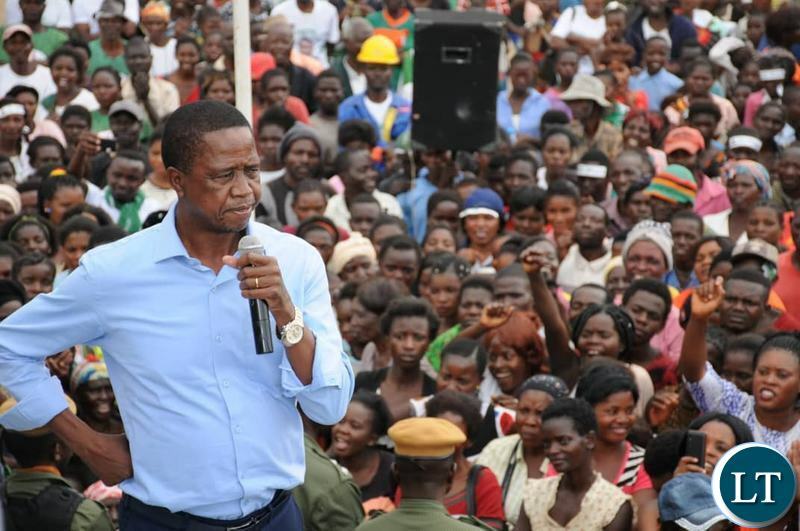 President Lungu is in the province to drum up support for the PF candidate in the Roan Parliamentary by-election, Joel Chibuye, slated for Thursday April 11, 2019. KOPALA LECTURES SESHEKEANS ON HOW NOT TO CAMPAIGN. NO BEES AND LIGHTNING, NO ROAD BLOCKING, NO USE OF CORRUPT COPS, NO FIGHTING AND NO BIGOTRY. Ulubuli fiko imwe ba Sesheke. Draw lessons from Kopala swags. I want to see if really CK’s manner of politicking packed with name calling and insulting works. A take down and thumbs down of archaic and backward polical exercise. Lets wait and see. The people will judge. Who was caught by police with pangas in sesheke, the ones shown on news ??? Was it not PF ?? Only one incidence reported that Kaizer shoot 7 times at Kambwili’s house. One day he will aim at one of PF leaders. Scary! Any news about anyone trying to kill? What has this lazy sausage Edgar done in the last 20 days apart from dancing like a foooool on stage. May democracy lead the way … may the best team win. Good luck to all candidates for both Roan and Bahati. Bamuntu what is this corporal swag this negroid is bragging about? You the same PF guys are just from ferrying thugs from Intercity Lusaka and right now they are terrorizing Roan residents. Who is causing violence? You spoke too early bwana – even before voting started at some polling stations! Without violence and rigging you PF can never win any election in Zambia. Have you seen latest pictures from Roan??? Bloody T-shirts! Is that what you call violence-free Kopala??? If that is violence-free, then what more when what you call violence begins happening…people will be dying!!! But very soon your strategy will catch up with you and you will all scumper, leaving ECL alone to take the blame and punishment. Nao ECL tulemweba talefwaya ukumfwa – lwakwe. Why are these pronoucments only come now after PTV exposed PF violence to the world ??? Zambia has seen unprecedented political violence under lungu…..it is only now after the sesheke expose of PF cader violence by PTV that lungu is trying to repair the PF image as a violent corrupt party. That said, well done , and this is what is expected from a ruling party that claims to be popular and wins votes on merit. If lungu showed such manners from day one , he could have had the whole country behind him. How is the ICC case going? Sometimes it is better to just encourage nonviolence on all sides than get hang-up on this SILLY BLAME GAME that has lost its meaning already. When are you people going to get it, grow up, and take responsibility and ownership of the part you have played in political violence? The only responsibility lies with lungu…..we have always said lungu can end violence with one phone call. Lungu has been the commander of the violence. How come only after lungu instructs his pf thugs to cease fire , we suddenly have no violence ????? All stronghold for UPND are marred with violence during bye-elections. This clearly shows that upnd is a violent party. This can be confirmed in both Bahati and Roan bye-elections campaigns. Honestly, there is no violence so far. “The PF will however stick to their mandate and distance themselves from any form of violence”. Against a backdrop of evil plans from NDC and UPNDEAD planning confusion and bloodshed. It’s tough being in the opposition. Whose gonna be taught a lesson? If You count all political Violence incidents in Zambia, which political party is constant in all of them? #5 Albert, that is a no brainer, trib.als of course! You know them, the ones led by the new president of Chimbwili’s faction of NDC, trib.al Hacks. @Spaka;Sesheke is history and all Zambians know too well that serious violence only occurs in known UPND strongholds. By the way,HAVE YOU SEEN ECL’S MAMMOTH RALLY IN ROAN ABOVE?COMPARE IT WITH THE FEW PEOPLE HH&KAMBWILI ADDRESSED YESTERDAY…KKKKKKK…..Numbers do not lie!! !Those pictucure have sent serious shivers in NDC/UPND camp! !We told you that Bahati and Roan are still PF strongholds.FROM THIS FRIDAY,UPND SHALL HATE KAMBWILI THE WAY THEY HATE GBM AFTER GBM’S UPND LOST TERRIBLY IN KASAMA CENTRAL TO MIGHTY PF IN 2016!! !We cant wait for the results on Thursday night.This time around,they will be no VIOLENCE EXCUSES FROM THE OPPOSITION both in Roan and Bahati!! !GOOD LUCKY MIGHTY PF!!! Walasa NJIMBU!!!! Another one will cry on 11th April,2019. PF did not employ violence this time become they are sure on Rigging both Roan and Bahati Constituencies. How can PF lose when they have captured ECZ and ZPS ? They won b4 the Votes are cast. The writing is on the Wall. I said it here yesterday that Lungu’s “three day working visit” was purely a disguised politics/campaign tour. My suspicions have proven true no wonder Zambia is getting poorer. President Lungu is the republican president and should have commended all political parties because there was no violence. The president should fully comprehend what it means to be the republican president I wonder if the president understood the implication of what he said about other political parties. Why would he wish other political parties to be violent? Feed your focus and starve your many distractions.I wish the PF government would work thrice as hard as they do in electioneering/politicking. You are deliberately avoiding the xenophobic attacks in Namwala. If that can happen when upnd is in opposition, what more if they form government. If you are waiting to celebrate victory, why should Kaizer Zulu be rigging the election by registering dead people. Due to the delay of the police and their refusal to arrest Kaizer Zulu means he has succeeded in registering thousands and thousands of dead people as voters for Roan. When will PF learn to win genuinely? @G15, how do you expect dead people to vote at the election. I wonder if ever you have been an elections officer and know the procedure used for one to cast a vote. Do you know what happens at table 1, 2, 3 etc up to the ballot box? How do the dead rise to come and vote. Shame on your ignorance. But Edgar Lungu knows that he has tormented us the Zambian people, and shamelessly so. Tell me now who is popular between Kambwili’s nephew and the PF! Tomorrow PF mops NDC in Roan. Don’t worry Ba ECL, the world outside State House is waiting for you when you come out in 2026 – if you don’t lose in 2021. Boss, PF better win Roan, because if you don’t, the whole country will laugh at you and might be the beginning of your end. Take advice: reduce on brutalizing the opposition because clearly you are no longer as popular, you now constantly rely on rigging and violence – remember that no strategy performs the same forever, one day your cadres will make a mistake and the opposition will win the presidency and you will dance pelete. Please reduce on brutalizing the opposition, because when time comes for you to dance pelete, Bowman Lusambo and Jean Kapata will not be there to dance with you, trust me.